APA Sheathing-grade panels are not manufactured with smoothness or appearance in mind, but offer strength suitable for most industrial applications. Common veneer grades used in APA Rated Sheathing are C or D, or a combination of the two. APA Rated Sheathing is also typically available as oriented strand board (OSB). 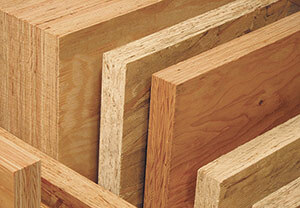 Learn more about sheathing & rough surface industrial wood panels. Learn more. Panels with A-grade and B-grade veneer faces are always sanded smooth in manufacture to fulfill the requirements of their intended end use – applications such as cabinets, shelving, furniture, built-ins, etc. Still other panels – APA Underlayment, APA Rated Sturd-I-Floor, APA C-D Plugged and APA C-C Plugged – require only touch-sanding for "sizing" to make the panel thickness more uniform. Sanded panels are fully sanded to a smooth surface while touch-sanded panels are sanded but perhaps not as uniformly as the sanded panels. Sanded panels can be manufactured in a variety of ways – as plywood (cross-laminated wood veneer), as composites (veneer faces bonded to wood strand cores), or occasionally as OSB. 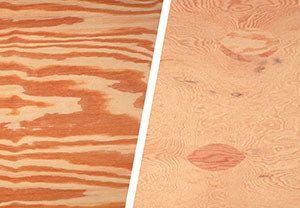 Learn more about sanded, solid & repaired face industrial wood panels. Learn more. Plywood and OSB panels are available with many types of face enhancements. Two common face coverings are a Medium Density Overlay (MDO) or High Density Overlay (HDO), which are resin-impregnated fiber surfaces bonded to one or both panel faces under heat and pressure. Other types of enhanced surfaces include fiberglass-reinforced plastic, polyethylene (HDPE), hardboard, metal and other materials for exceptionally smooth or special-use surfaces. 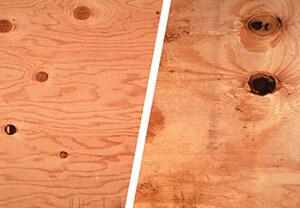 Learn more about enhanced faces, overlaid & coated industrial wood panels. Learn more. Panels for industrial applications can be manufactured in a variety of thicknesses and sizes. While common sizes are 48-inch widths and 96-inch lengths with thicknesses of 1/4 inch to 3/4 inch, both plywood and OSB can be manufactured in wider, longer and thicker sizes. Learn more about custom sizes and over-sized industrial wood panels. Learn more. 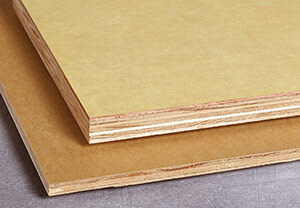 Oriented Strand Board is a widely used, versatile structural wood panel. Manufactured from water resistant, heat-cured adhesives and rectangular shaped wood strands that are arranged in cross-oriented layers, OSB is an engineered wood panel that shares many of the strength and performance characteristics of plywood. 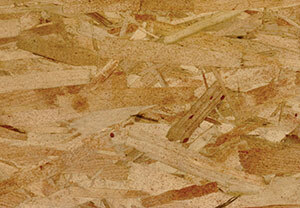 OSB's combination of wood and adhesives creates a strong, dimensionally stable panel that resists deflection, delamination, and warping; likewise, panels resist racking and shape distortion when subjected to demanding industrial applications. Relative to their strength, OSB panels are light in weight and easy to handle and install. Learn more. 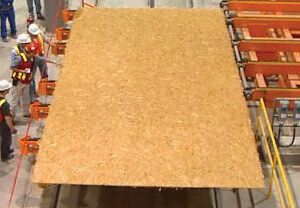 OSB is produced in huge, continuous mats to form a solid panel product of consistent quality with no laps, gaps, or voids. Finished panels are available in large dimensions and a variety of thicknesses. APA OSB products are exempt from the leading formaldehyde emission standards and regulations. Learn more about formaldehyde here. SCL includes laminated veneer lumber (LVL), parallel strand lumber (PSL), laminated strand lumber (LSL) and oriented strand lumber (OSL). The term was coined to capture a wide array of products, some of which are proprietary or unique to one manufacturer. In SCL billets, the grain of each layer of veneer or flakes runs primarily in the same direction. SCL is a solid, highly predictable, and uniform engineered wood product that is sawn to consistent sizes and is virtually free from warping and splitting. Learn more.